The flooding in the Plains and Midwest has fallen out of the national news again, but the effects of the flooding remain a disaster on a scale seldom seen in the modern era in the United States. Reuters and other news sources report that millions of bushels of grain stored in silos have been ruined. The grain in the flooded silos became swollen and ruptured those silos on many farms. And even if some of the grain appears salvageable, farmers have to destroy it all — the risk of toxic mold is simply too high. Years of market saturation and low prices led to farmers storing record amounts of their harvest. And unfortunately, the Department of Agriculture's current relief programs can't do anything to help compensate farmers who lost such crops to flooding. There have been large-scale USDA relief programs for massive losses suffered from trade-war effects, cattle losses, field-debris removal, and some compensation for farmers unable to plant spring crops in flooded fields. Lost grain in storage is another matter. 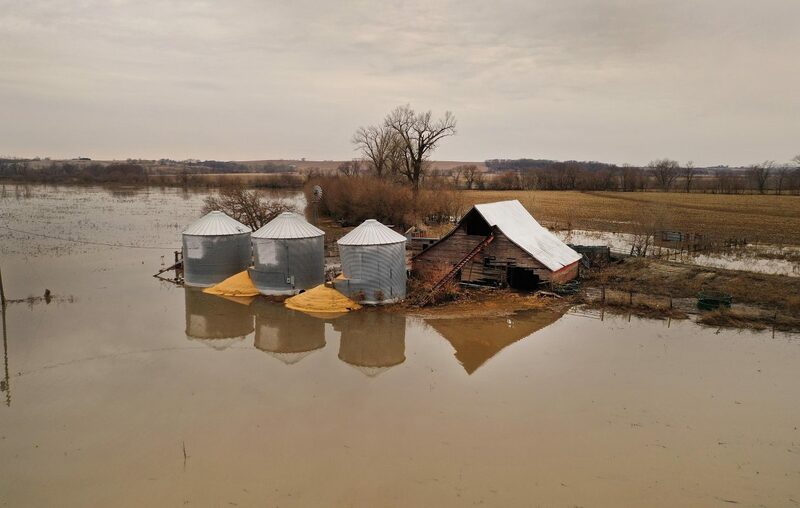 In general, relief for stored grain losses hasn't been considered critical because the types of flooding that reached silos typically came with advance notice, giving farmers time to move stored grain to drier locations. This year, we've had plenty of warning about the types of flooding still to come to large river basins, but the flooding that has already hit Nebraska, Iowa and South Dakota so hard came with much less warning. The “bomb cyclone” that produced a roaring blizzard on the high plains also brought soaking rains and thawing snow on top of frozen soils, maximizing runoff and flooding with no place for absorption of the melt and rain runoff. Multiple levees and dams failed in this onslaught, exacerbating the rapid water rises even on a flat landscape. In Iowa alone, 416,000 acres in six counties were inundated. Losses include stored corn and soybeans. Some farmers will receive aid for dealing with the piles of debris in their fields, but not for the grains they lose. In some locations, railroad tracks leading to storage silos have been inundated or badly damaged. Some farmers have been calling the USDA with their concerns about fulfilling previously signed contracts for sale of their stored grains. As of this time, the amount of stored soybeans is at a record high, and corn is at its third highest level. 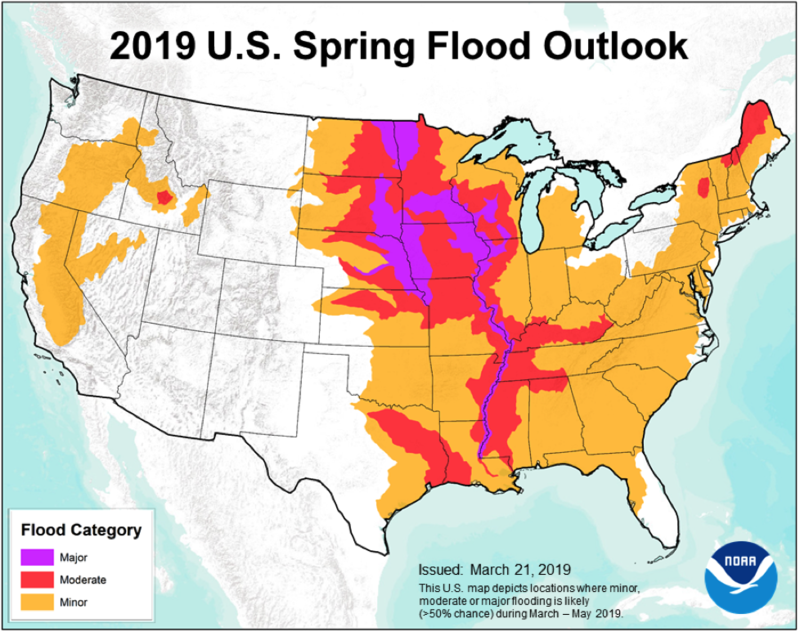 As for the flooding yet to come: The flooding in the Mississippi and Missouri River basins will develop more gradually, but most or all of it in the outlook is inevitable. The flooding hurt more than just grains. The damage at Offutt Air Force Base near Omaha, Neb., is major. No aircraft were lost, but structural damage was enormous, and runways were affected as well. Offutt is home of the U.S. Strategic Command (and formerly the Strategic Air Command), our nuclear strike command center. The danger to Offutt from flood potential has been known at least since a 2011 study following a damaging flood. At the time, it was determined that a new levee needed to be built to protect the base and its runways, but there was almost no follow-through. Each military installation has its own particular vulnerabilities to the elements, so there is no Department of Defense one-size-fits-all fix. The DOD has been studying environmental risks that will worsen in the face of climate change at American installations around the world, but preventive precautions have been slow to develop. The levee for Offutt was approved, but it will come too late. Speaking of domestic military weather disasters, Tyndall Air Force Base in northern Florida remains in a massive rebuilding phase. Every one of the base's 1,200 facilities suffered hurricane damage from Category 4 Michael on Oct. 10. Michael’s rapid and partially unexpected rapid intensification to Category 4 may be tied to waters in the northeast Gulf of Mexico being significantly warmer than usual for early October. It is possible Michael’s ferocity may be a result of a synergy between near-term weather (favorable low wind shear, abundant moisture) and elements of climate change (atypically warm sea surface temperatures, which have been linked to warming oceans). While the warmth was not unprecedented, readings were warmer than the average already-warm Gulf temperatures at that time of year. As part of basic thermodynamics, additional warmth injected into a tropical cyclone supplies more energy for intensification. While the DOD is not insensitive or uninformed about added risks posed by a mean warming climate, its action plans may have to be accelerated because oceanic warming is running ahead of predicted schedule in most parts of the world. Don Paul – Don Paul worked as a broadcast meteorologist for 34 years at all three Buffalo television stations, serving as chief meteorologist at WIVB for 29 years and chief at WGRZ for three years.